Introduction: Based on the current clinical evidence, there is no clear survival advantage between adjuvant (aRT) and early salvage radiotherapy (sRT) in prostate cancer (PCa) patients referred to radical prostatectomy (RP) with adverse pathologic characteristics. 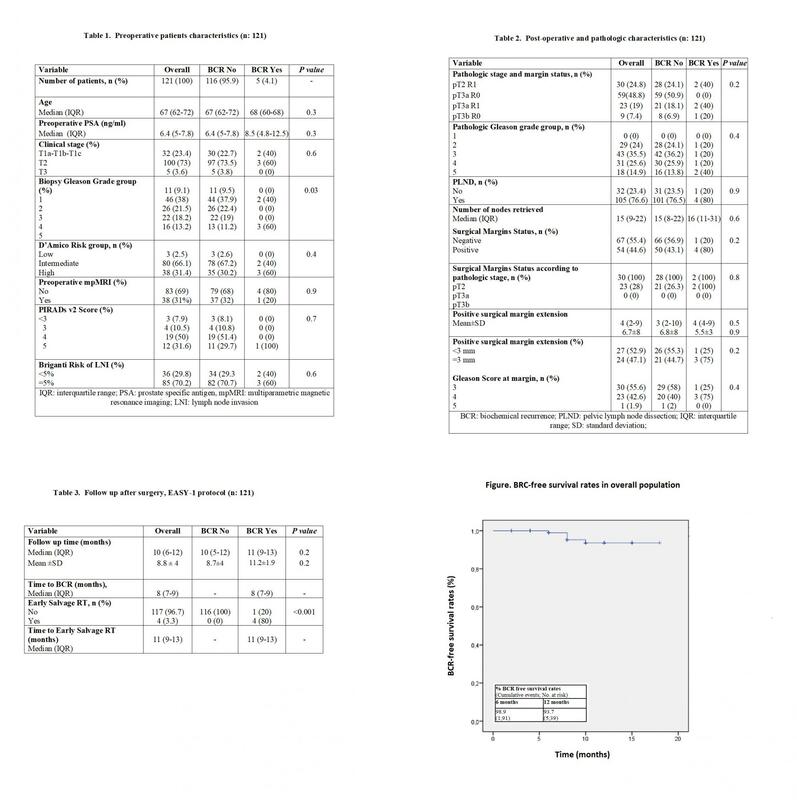 The aim of this study is to evaluate the early oncologic benefit of a strict surveillance protocol and early sRT in the postoperative management of PCa patients with intermediate-high risk of recurrence after surgery. Material and methods: We prospectively enrolled 136 PCa patients submitted to RP between October 2016 and February 2018 at our Institution and included in a IRB-approved follow-up protocol (EASY-1: EArly Salvage RadiotherapY-1). Inclusion criteria were: PCa patients treated with RP; pT2 PCa with positive surgical margins (R1) or pT3a regardless surgical margins status or pT3b with negative surgical margins (R0); PSA undetectable at 40 days after surgery. Lymph node invasion was considered as exclusion criteria. The surveillance protocol included PSA dosage every two months after surgery during the first year, then every three months during the second and third year, followed by PSA every 4 months till the fifth year. Early sRT has been performed for patients with biochemical relapse (two consecutive values of PSA ≥0.2 ng/ml). 68Ga-PSMA PET/CT was performed before early sRT. Results: Our analyses included 122 patients with a minimum follow up of 2 months. The median (IQR) follow-up of the entire population was 10 (6-12) months. Patients were stratified into two groups according to presence of BCR. Table 1 depicts preoperative patients’ characteristics. Overall, 5 (4.1%) experienced BCR. Median preoperative PSA was 6.4 ng/ml. Men who experienced BCR had a significantly higher clinical Gleason grade groups compared to individual without BCR (p=0.03). Between two group we did not found significant difference concerning preoperative characteristics. Table 2 shows the pathologic characteristics of our population. Overall 30 (24.8%), 59 (48.8%), 23 (19%) and 9 (7.4%) patients revealed pT2R1, pT3aR0, pT3a R1 and pT3bR0 disease, respectively. Lymphadenectomy was performed in the 76.6% of cases, all resulted as pN0. Patients with R1 were 46.3% (80% in cases with BCR and 43.1% in cases without BCR; p=0.2). Considering R1 patients, a positive surgical margin ≥3 mm have been found in 44.7% of men without BCR and in 75% of patients with BCR (p=0.2). The median (IQR) time to BCR was 8 (7-9) months. Out of 5 patients with BCR, 4 were submitted to early sRT (1 person refused the proposed treatment). The median (IQR) time of early sRT was 11 (9-13) months after RP (Table 3). The BCR free survival rate was 93.7% at 1 year (Figure 1). Conclusions: Strict surveillance with PSA monitoring every two months during the first year after surgery and early detection of BCR can avoid aRT and spare sRT within 1 years follow up in a consistent proportion of PCa patients with intermediate-high risk of recurrence after RP. The survival benefit of such aggressive surveillance and modulated early sRT needs to be evaluated at longer follow up.